Scene setting: It’s not every day that one can enter the Russian Embassy as casually as we did today. It seemed a strange choice of venue for the Comme des Garçons show, almost one charged with meaning, although what Rei Kawakubo prescribed meaning we do not know. Be as it may, merely seeing the building is fascinating: a strange mixture between Soviet aesthetic and post-soviet bling, it holds the expected cyclopean proportions, the gilded details and the most unusual carpeting in corporate USSR red. The small pristine white salon in which the show was to take place had an accumulation of abstract crystal lamps which hung from the ceiling. Moodboard: The setting might have been totalitarian, but the collection couldn’t be further away from those aesthetics. Which was obvious from the very first look, all red vinyl and pastel-coloured plastic toys, imagined as 3D graffiti, stuck to the model’s hair. It was best described by the Japanese term: kawaii- a term for cuteness within Japanese culture. Overblown volumes, seemingly infinite superpositions and padded proportions were everywhere, sometimes in silver jacquard mixing traditional Japanese sea motifs and pop culture. Other times, it was a mix of virginal white poplin and non-virginal latex. But two looks stood out overall, both of them featuring an overblown multicolour anime print (works by 12 artists were featured in the collection, from a variety of countries and times), with the face of a Sailor Moon-esque character fully featured in the front of both dresses. It felt experimental, but it also felt like a commercial version of those dresses would sell out in a wink. Finshing touches: Hair and make up are always a big part of every Comme Des Garçons show. This time, models - mostly redheads - wore their manes extra frizzy and just as overblown as their clothes. Some of them looked like oversized versions of eightied afro haircuts, but some of them were in total disarray, including Japanese toys in all sorts of kawaii shades of plastic. The last look - an impressive red vinyl ruffled dress - was even paired with a necklace made out of those same toys, making us as excited about it as if we were kids in a toy store. And, of course, we have to mention the kitten-heeled trainers, an unexpected collaboration of the brand with Nike. 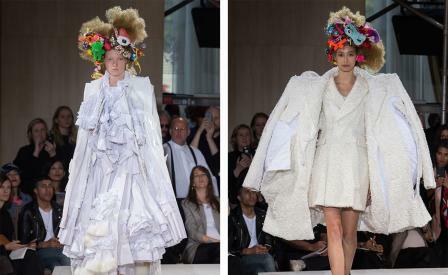 Then again, at Comme des Garçons we’ve learned to always expect the unexpected.